What a difference a few months can make. After a very volatile 2018, markets have closed their best quarter in over a decade, a rising tide of investor optimism lifting all risk asset boats. While there was no shortage of economic concerns this quarter, investors shrugged off recessionary fears and instead focused on the positives: the pause in interest rate hiking, low inflation, slowing but still growing corporate earnings, and progress signs regarding China-U.S. trade talks. On the economic front, the modest spending increase in Canada’s 2019 federal budget does little to alter the softening outlook for the Canadian economy. The onus is therefore on the Bank of Canada to support growth. The U.S. economy has also begun showing signs of deceleration, joining the rest of the world in a soft patch. Across the pond, the European Central Bank surprised markets with a new round of stimulative financing in the form of very low interest rate loans to eurozone banks. As well, China’s industrial output growth fell to a 17-year low alongside a rising jobless rate, prompting the Chinese government to announce additional tax cuts and infrastructure spending. A likely explanation for the slower growth is that country-specific issues have begun weighing on activity in the world’s top economies – the U.S., China and Europe. This contrasts with the financial crisis of 2008/09, where the decline was not due to a combination of national factors, but rather a single global shock. This lends credence to the many market pundits who forecast a steady cyclical slowdown ahead, rather than a steep recession or crash. The question we now face is whether a more accommodative stance from central banks can provide the backdrop for a sustained upturn in economic growth. We have our doubts about this, seeing as we are already in the latter stages of economic expansion. Nevertheless, Q1 has shown us that the world economy is far from plummeting, which was a plausible (albeit minor) concern as recently as December. Furthermore, the majority of data points do not indicate that a recession is imminent, rather that this cycle has been extended. 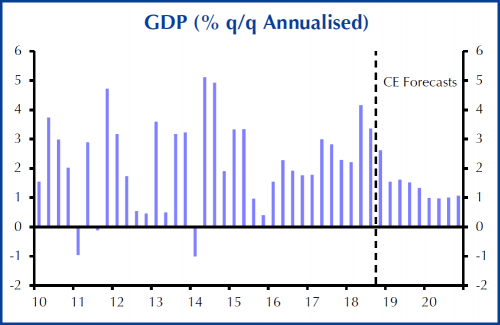 While the beginning of Spring typically evokes an air of hopefulness for the rest of the year, with respect to the global economy, growth is likely to remain muted until clearer signs of improving conditions materialize. The synchronized behaviour of equity and bond markets came roaring back in the first quarter of 2019 following a short-lived de-coupling in late 2018. Central bank announcements in both January and March provided fixed income investors (and equity investors) with the assurance that inflationary pressures remain low, economic growth continues to slow and interest rate hikes are off the table for the foreseeable future. Bond markets in both Canada and the U.S. recorded one of their strongest quarterly returns in Q1. The renewed optimism by market participants from the change in tone by central banks resulted in significant declines in interest rates across the entire yield curve, with the most pronounced decline occurring in March. The 10-year Government of Canada yield declined a further 35 bps over the quarter, while the 2-year yield fell 31 bps – material declines considering rates dropped by similar magnitudes in 2018Q4. Not only did the government bond market perform well in Q1, but the corporate bond market benefitted to an even larger extent with credit spreads tightening across the yield curve but more so at the short and mid ends. Lower quality bonds, particularly non-investment grade, benefitted the most from the halt in interest rate hikes with the U.S. high yield 1-3 year corporate bond index declining 139 bps. For the quarter, the Canadian bond market (FTSE Canada Universe Bond Index) returned 3.9%, with the long-term bond market up 6.9% and the short-term bond market increasing 1.7%. Notable sub-sector performers include the provincial government long bond index, which was up a whopping 7.6%, and the corporate mid bond index, which returned 4.7%. It never ceases to amaze how quickly market sentiment can change following central bank pronouncements. Central banks have clearly demonstrated their commitment to adjusting monetary policy based on economic data, as well as using all available tools to ensure that financial markets and economic growth are not significantly negatively impacted by the high debt levels in the global economy. With interest rates now likely to remain low, albeit with continued volatility, we believe that active management remains key to adding value as active managers are better positioned to identify and access attractive opportunities, including non-traditional strategies, in the fixed income market. As mentioned, stock markets recorded remarkably strong gains to start the year. Investors were keen to bid up equity valuations once central bankers provided assurance that monetary policy would remain supportive of growth, and as economic data signaled that a recession was not imminent. Canada has been one of the top-performing equity markets as of late, posting a 13.3% gain for the quarter. This return has more than offset last year’s negative performance. The reversal in sentiment was linked to solid corporate profitability as well as rising expectations that the Bank of Canada may eventually lower interest rates due to slowing economic growth. South of the border, the U.S. Federal Reserve’s similar change in tone regarding the interest rate environment helped support equity prices. Earnings expectations for 2019 have come down significantly compared to 2018, yet still remain in positive territory. Market analysts believe they could surprise on the upside if various economic and trade policy risks are resolved favourably, as well is if the Fed maintains its dovish approach. The U.S. stock market returned 11.2% for the first quarter of 2019. Overseas, all major stock markets rebounded in the first quarter as well, offsetting much if not all of 2018’s late-year sell-off. 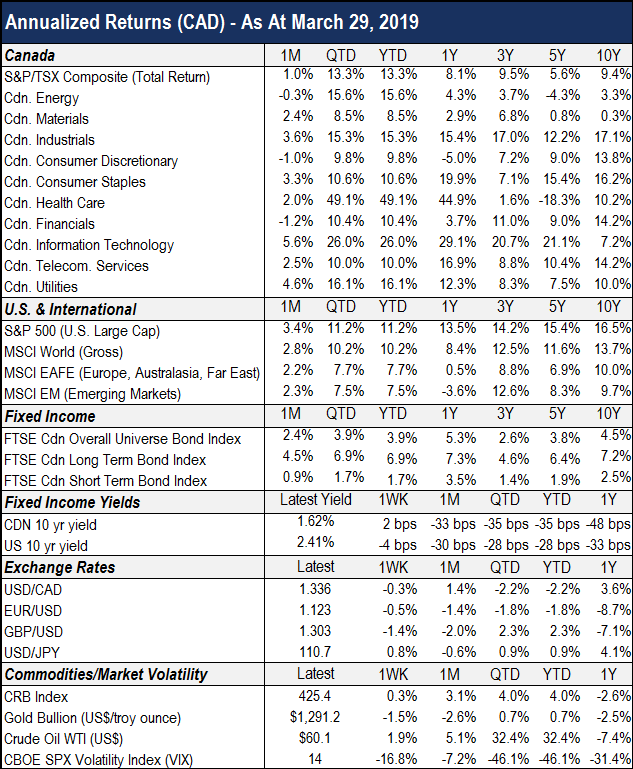 International markets (ex-North America) and Emerging Markets returned 7.7% and 7.5% over the period, respectively. Last quarter’s rebound serves as a reminder that volatility and risk are very different. Volatility is a temporary setback in asset prices, whereas risk is the notion of permanent capital impairment. They key for equity investors is to have a proper investment policy in place in order to comfortably navigate through periods of stock market volatility. Looking at the balance of 2019, solid corporate earnings and economic data are likely to assist equities in delivering further upside, however near-term issues present risks that could derail one of the longest bull markets in history. Slowing economic momentum, an eventually tighter turn in monetary policy, and trade tensions are all reasons for stocks markets to remain on edge. However, these risks are counterbalanced by the pause in interest rate hiking, better-than-anticipated corporate earnings, still solid economic growth and optimism that a China-U.S. trade deal might actually be in the cards. As we have previously stated, sharp back-and-forth market action is likely to persist in the coming weeks and months, until investors start seeing clarity on some important subjects. While optimism has returned to financial markets thanks to central bankers, risks remain and volatility will continue to be present in both bond and equity markets. No one knows how the rest of the year will play out, but the overall investment environment remains positive with low interest rates, modest inflation and corporate profit growth. While mindful of the risks, our portfolios remain strategically positioned to favour equities within the context of each client’s target asset mix as we believe the asset class provides long-term investors with superior returns. We continue to seek out non-traditional investments that have low correlations to public bond and equity markets to enhance the risk-adjusted returns for our client portfolios.